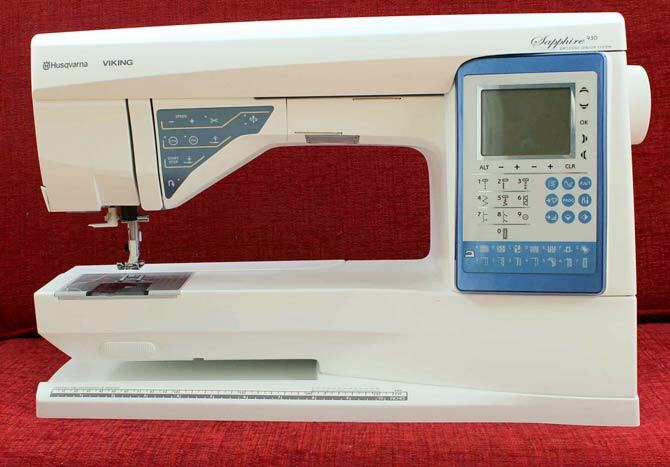 I’m very excited to be back and this time I’m going to be looking at the Husqvarna Viking Sapphire 930 sewing machine. This is another fabulous machine with a lot of very exciting features. This week, we’ll have a really good look at some aspects of sewing and quilting and I’ll show you how easy it is to achieve spectacular results with the built-in features/functions and tools of the Sapphire 930. I’ve got a great project lined up for later this week – something that everyone needs. Today though – we are going to look at tension! Machine tension that is. 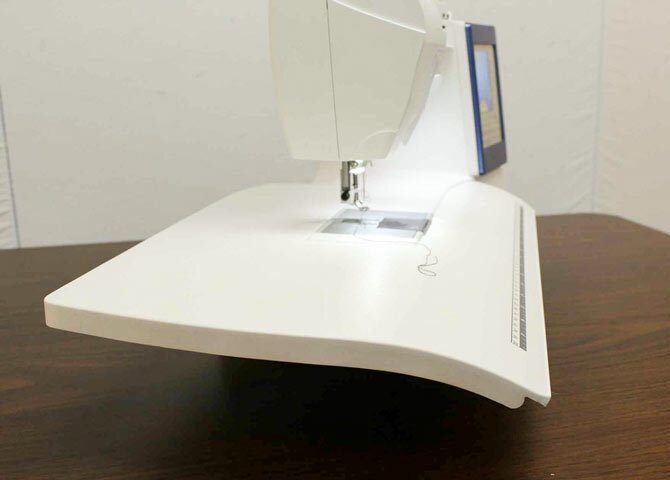 The Sapphire 930 comes with a removeable accessory box making it easy to use the sewing machine in free arm mode. Something that comes in handy when dealing with tight areas as in bags or clothing. While you can sew with the accessory box attached to the sewing machine, I prefer to sew with the sewing machine set into a cabinet or I attach the amazing extension table. If you’ve been following my posts, you know that I rave about this extension table. You can check out my comments in this blog post. 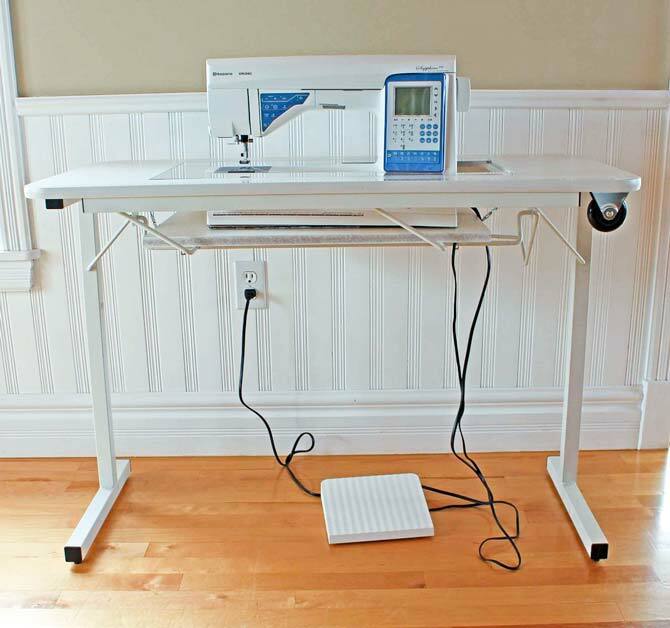 The other thing that is fabulous about this extension table is that it’s compatible with all of the larger sewing machines from Husqvarna Viking starting with the Opal. This is a huge bonus especially if you have more than one Husqvarna Viking sewing machine. We won’t go there! At a recent sewing retreat, Susan was using an older style of extension table without the curved edge. She was having trouble while she attempted to quilt her table runner as the table runner kept catching on the straight edge of the table. I happened to have my extension table with me and wasn’t using it (you’ll see why in a minute), so I lent her my table. Let’s just say that she borrowed the table even after the retreat so she could enjoy finishing the table runner. Oh yes – it makes that much difference! The picture above is of the extension table on a different model of Husqvarna Viking that I reviewed earlier. Alas – I do not have the extension table with me. However – there’s a good reason. I’m currently hanging out on the East Coast and I didn’t want my sewing machine to take up valuable table space so I brought this with me instead. This portable sewing table is brilliant. It’s easy to set up, it doesn’t weigh too much, folds flat for transport which is good because plenty of projects sat on top of the table on the ride down! A custom cut insert fills the space around the sewing machine. It means that I can sew and not hog up space on the kitchen table. I love it! 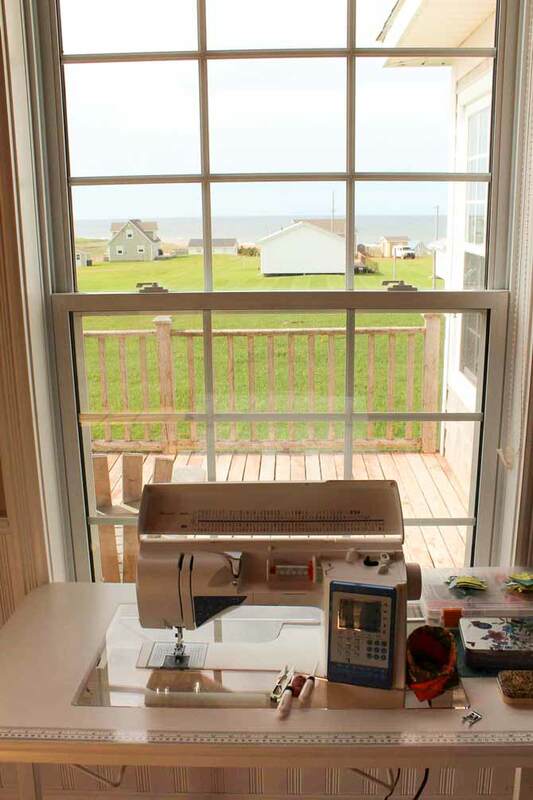 Now it would be boring to sew facing that wall – I might as well be at home. So – this is really my view when I’m sewing. Another feature I love about this table is the amount of space that’s on the right hand side of the sewing machine. There’s plenty of room to put stuff and we need stuff – our tools, our project pieces, a cup of tea. Also there’s loads of room in front of the needle which is a huge bonus when trying to match seams or keep your fabric straight. The table is well designed and I won’t sew “AWAY” without it! There isn’t a lot of room for quilting a quilt so one must pick the projects accordingly. 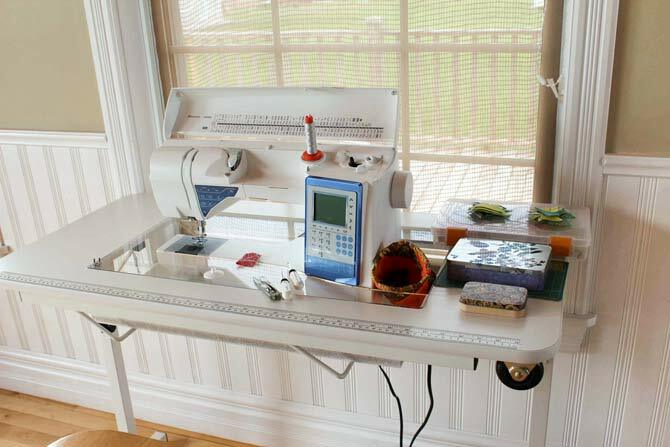 The portable sewing table is well designed with lots of room in front of the needle and plenty of space to the right for stuff and to the left to support the pieces you are sewing. Let’s get ready to sew! This is how the Touch Panel looks when you turn on the Sapphire 930. There’s a lot of information on the Graphic Display and the Touch Panel. We’ll be touring through parts of it this week. The first thing I do is drop that stitch length down to 2.0. Check out this blog post in case you don’t remember why. I’ve talked about the Exclusive Sewing Advisor before but it’s such a fabulous feature, I’m going to chat about it again. 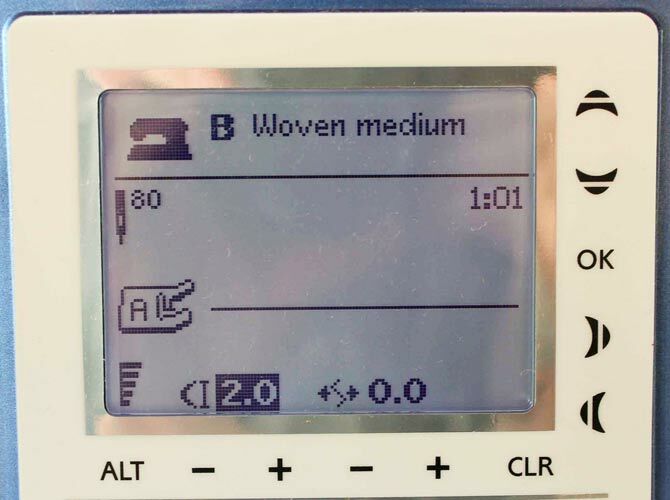 By pressing the appropriate button for the weight and type of fabric that you are using (choose from A woven light, B woven medium, C woven heavy, D stretch light, E stretch medium, F stretch heavy or G leather/vinyl) and the sewing technique you wish (seam, overcast, seam and overcast, baste, blind hem, hem and buttonholes), or choose a desired stitch from one of the menus, the Exclusive Sewing Advisor will set the thread tension, the appropriate stitch, the stitch length and many other details. You don’t have to think – let the Exclusive Sewing Advisor do it all for you! I love the Exclusive Sewing Advisor. 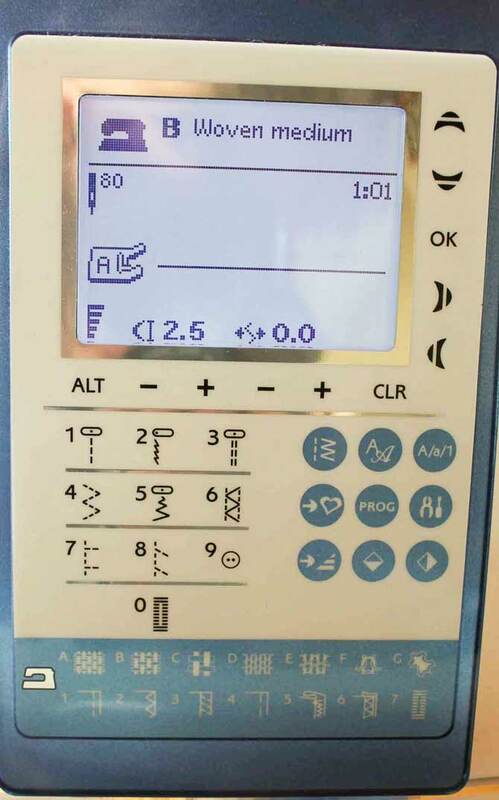 Actually I love all features that make sewing easier but in order to appreciate what these time saving features do, we should learn what goes on behind the scenes. Wait – this isn’t going to get technical! 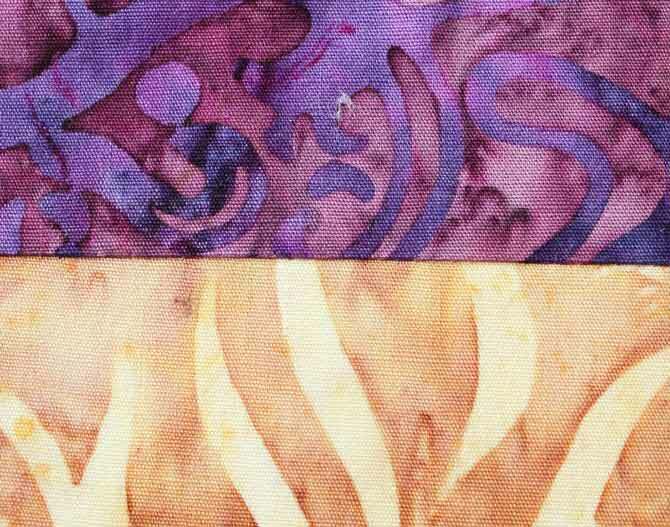 Let’s play with those tension settings so when we want to go crazy with thread weights or wild quilting, we’ll know how to deal with the tension. Let’s press that seam (to one side) to see what it looks like from the front of the piece. Notice that I do NOT see any of the thread at all. The other thing to note is that I’m using batiks which are notorious for skipping stitches. But I have NO skipped stitches in any of my project. Time to mess with the tension. The only way to learn about thread tension is to play with it. 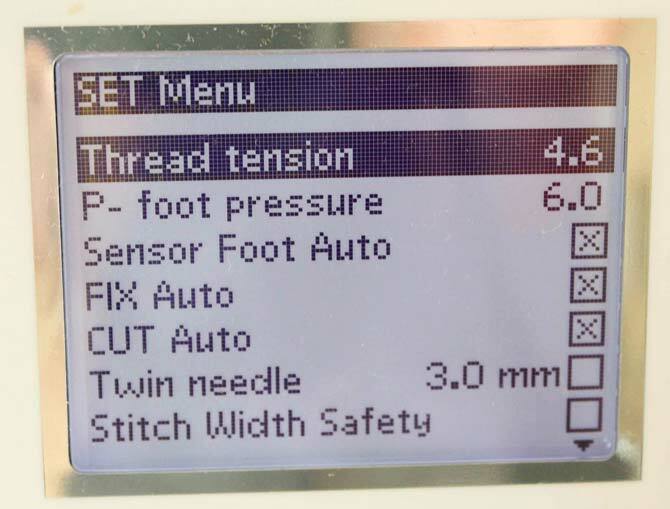 Some sewing machines have a dial for the top thread tension, while computerized sewing machines like the Sapphire 930 will have a setting in a menu (the SET menu) that allows you to override the defaults. 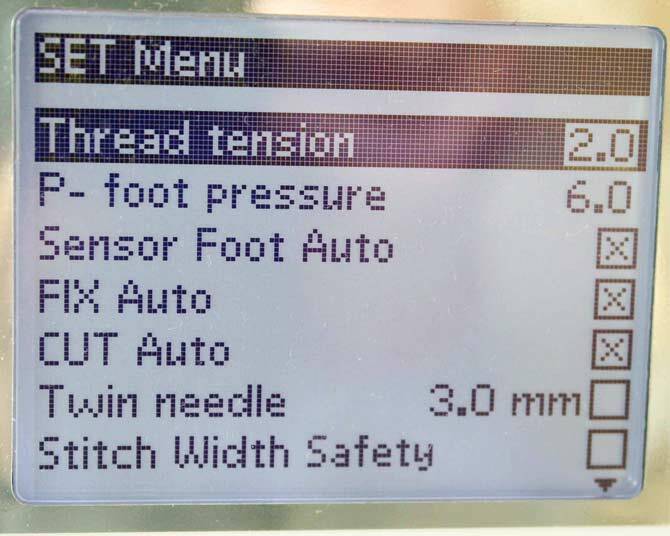 The settings range from 0 which means there’s NO tension on the top thread to 9.8 which is a LOT of tension on the top thread. We are only playing with the top thread tension here. If you wish to play with the bobbin tension, I strongly suggest that you purchase an extra bobbin case or get a Husqvarna Viking specialty bobbin case which allows you to bypass the tension mechanism completely if you want to do bobbin work. Otherwise you should be able to adjust almost all tension issues by playing with the top tension. It looks like the Sapphire 930 is able to handle this particular thread/fabric/sewing technique combination even if the top tension is tight which is a good thing. It means the tolerance levels for the tension have a lot of play in them and will be less fiddly to adjust. Let’s adjust the tension in the opposite direction and see what happens. And when we look at the back? Oh boy! Because there was no tension on that top thread to hold it in place, the thread was pulled to the back in large loops. NOTE: Sometimes we see this happen on our work even if we have NOT touched the tension. In that case, something has happened with the threading. Best to remove the thread from the sewing machine and the bobbin and re-thread them both. That usually solves that problem. OK – so we know that there has to be some kind of tension on the top thread (at least with this thread). So what happens when we tighten that top tension by a couple of numbers? 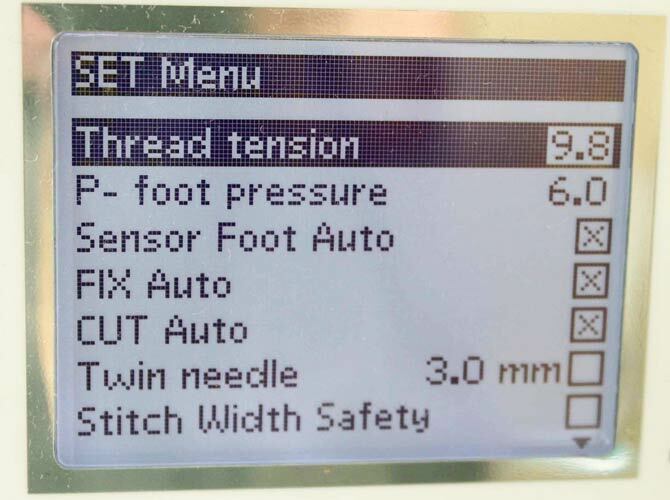 The thread tension settings on the Sapphire 930 are adjustable in increments of 2. I went directly to a setting of 2.0 to see what happens with the top thread tension. While the tension is better, it isn’t right. I can feel a hard ridge of thread with this seam. If you can feel the thread in the seam, there’s a good chance the tension isn’t right. 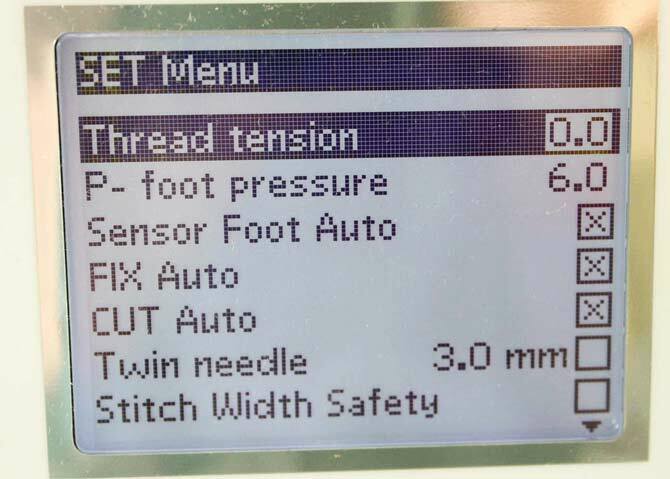 There you have it – a quick lesson on how to adjust the thread tension on your sewing machine. 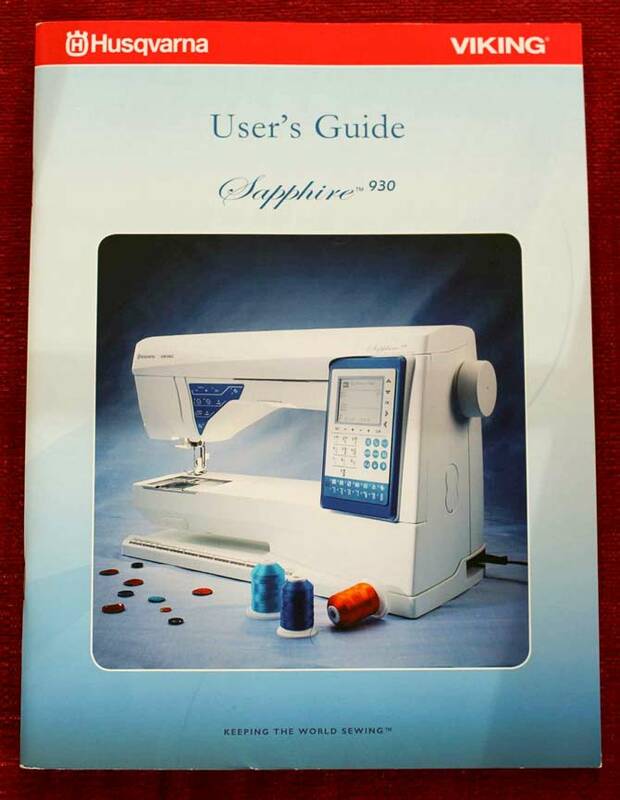 The Exclusive Sewing Advisor on the Sapphire 930 takes all the guess work out of the tension. However I may want to use invisible thread on the sewing machine, I may be working with some very thick threads or two completely different weights in the top and bobbin. While the sewing machine can handle most options, the more creative you are, the more prepared you need to be to play with the top thread tension. I’m amazed at how many people have never touched this feature on their sewing machine, yet I have seen many seams that are poorly constructed due to bad tension. 1. “I don’t have time to play.” But you do have time to rip out stitches! 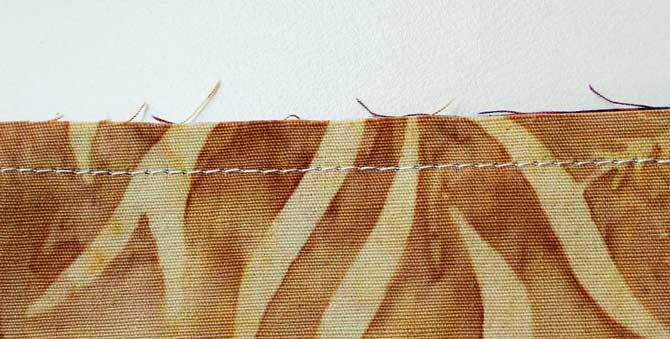 By playing with the tension on your sewing machine, you’ll learn how to make quick adjustments to make better projects. And sewing machines like the Sapphire 930 come with loads of options for accommodating whatever type of project we throw at it. 2. “I’m afraid of the tension.” But you are not afraid to rip out stitches! We’re afraid of everything we know nothing about. 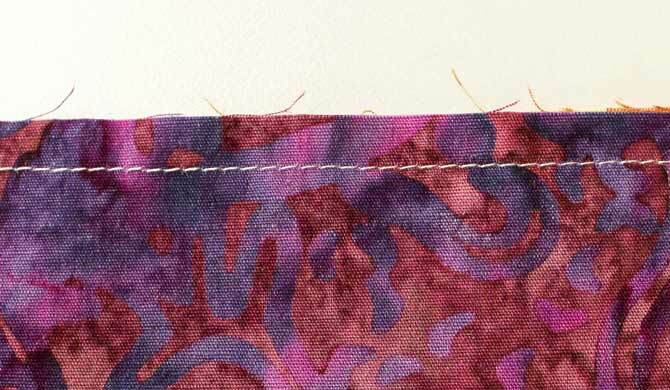 Take the time to play with the tension on your sewing machine and soon you’ll be sewing up a storm. Can’t say this enough, but you MUST check the tension every time you do something different like change the thread brand or the thread type or the thread weight. When in doubt – read the manual! I’m hearing that a lot lately. Why? Because people have been reading the blog posts and I keep saying that! Yes – I’m not good at reading manuals, but trust me, I’ve learned oodles about sewing machines since I took the time. It pays to read the manual. Now you don’t have to learn everything, but you should know how to find information, learn how the manual is laid out. Learn what basic features your sewing machine has. Explore the sewing machines functions – don’t wait for a class to have someone show you. Get adventurous – check out the menus, push all the buttons – you know you want to! Wasn’t that exciting? It’s not enough for me to be told how something works. I need to mess with it in order to understand it. Once I understand the relationship – then I can make anything sing. Well almost. I hope you enjoyed the experiments with top thread tension. Why not give those tests a whirl yourself? Try with different thread types in the top and bobbin. Mix thread weights – try some quilting. What happens? The more you play, the more informed you are and the better your projects and quilting turn out. 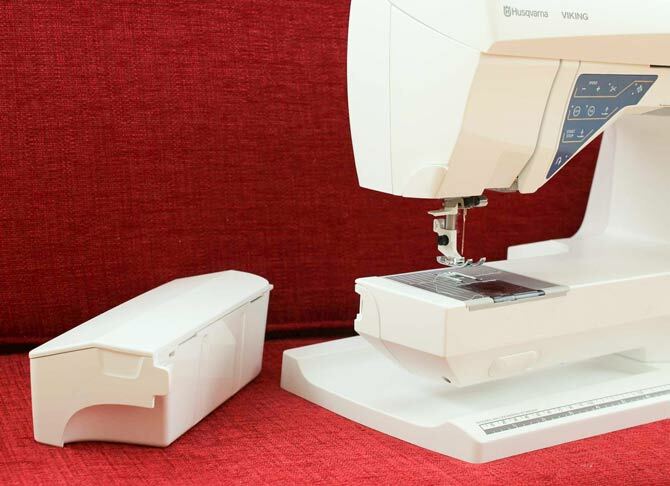 Tomorrow, I’m going to provide more sewing and quilting tips as I take a look at a couple of other features of the Husqvarna Viking Sapphire 930 sewing machine. Stay tuned for my project later this week. Have a great day! Ciao! Thank you for all of the wonderful info. I’ve been sewing / making quilts for about 12 years now and also make fleece lined sweater mittens. I’m looking to invest in a better sewing machine and have been looking at the Saphire 930. But when I’m reading reviews, it seams a lot of people are having issues with it. Could you let me know your thoughts, if you would suggest this machine or are there others you like as well? I’d like to stay under $2000 if possible. I also want to make sure this would be good for sewing the fleece lined sweater mittens (they can be pretty thick). I cleaned my sapphire 930 and now it won’t sew forward, only reverse. The reverse light is not on. Can you help? Hi Jody, probably something silly that might have gotten switched while cleaning. I would ask my dealer, they’ll have the answer in no time at all! Call today! I have a Sapphire 930 since july 2015. The machine has problems with the tension. Sometimes the ‘verknoping van de draden’ is on the underside somtimes it’s a the upperside. I took the machine to the dealer, he changed the tension at the bobbin. In the shop he sewed and is was good. When I used my machine at home the problems with the tension began after I sewed half an hour. Before I bought that Sapphire I had an 25 year old husqvarna 1100 and it with that machine I had never problems. My 1100 was broken and the cost to repair it was to high. That was the reason why I bougt a new machine. I have regrets that I bought this machine and if I had known before, I wouldn’t have bought the machine. Sorry, about the language faults I’m from Belgium and I don’t speak English…. Hi Liesbet, It’s a good idea to return the machine to your dealer with samples of what is happening with the tension. Samples, along with the THREAD you’re using, will help the service technician understand what is happening with the machine. If you’re still unhappy with the performance of the machine you can also have the service tech send the machine into the main office for the Service department to check. The technician should know where this is in or around Belgium. I hope this is helpful to you. My sewing machine is running well without jamming or tangled. But the threads are not knotting together. Ultimately there is no stich on the cloth. Some one answer my question please. I love this look into sewing machines. It is great to see details about ones that I don’t have for future reference. That’s exactly why we review them! I’m so glad you’re finding them useful! i have this machine too and I love it, even though I haven’t explored all that it’s capable of yet. I will read your post more in depth when I can (at the airport right now). I loooove the extension table too!